In January, 1912, tens of thousands of immigrant women, men and children led the Bread and Roses strike at a textile factory in Lawrence, Massachusetts. The workers clashed with textile mill operators and police as they asserted their demand for humane working conditions. During this cold and snowy January, pitched battles were fought in the streets of Lawrence in one of the most brutal strikes in U.S. history. 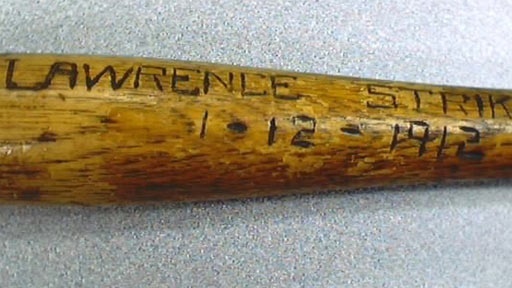 A billy club with the words “Lawrence Strike” and the date 1/12/1912 has been passed down to a History Detectives contributor. But could this lethal-looking truncheon really have been used in the famous Bread and Roses labor strike in Lawrence, Massachusetts? The club belonged to the contributor’s grandfather. How and why did his grandfather possess it? History Detectives travels to Massachusetts to understand who was involved this struggle that paved the way for improved labor conditions throughout the country. Also with Wes Cowan Little Bighorn Bayonet Could this bayonet have been used at one of the largest massacres of U.S. soldiers by American Indians? Also with Wes Cowan Pretty Boy Floyd's Gun Did this vintage Colt handgun belong to the outlaw Charles "Pretty Boy" Floyd? Also in Season 4 Car Tape Deck Is this an example of the first ever commercially produced car tape player? Also in Emerging Modern America: 1890-1930 Connecticut Farmhouse Why did this Connecticut farmhouse have so many owners in such a short space of time?